With weather delays and soybeans maturing late this year, many producers were or will not be able to seed winter wheat at the optimum time for top yields. This includes areas where fields were too moist while other areas were too dry. 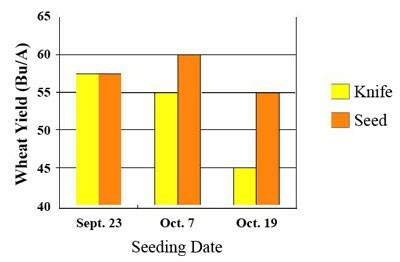 Figure 2 shows the effect of three seeding dates with knife- and seed-placed phosphorus at three locations in Nebraska. The results of research by Kansas State University on seeding dates in northwest Kansas in the Colby area where the optimum seeding date is Sept. 26 are in Figure 3. These results show the four-year average yields for each treatment in the study. 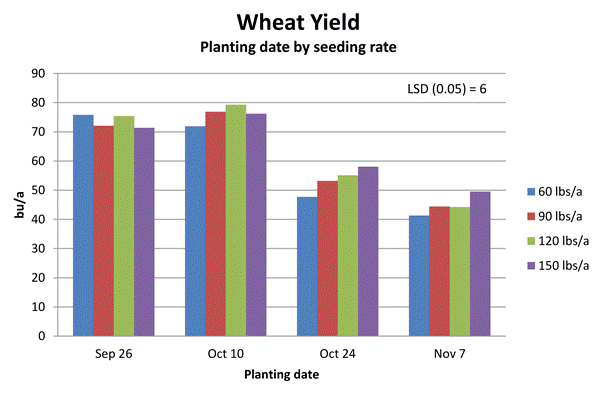 Wheat yields were much higher when planted at the optimal time: Sept. 26 or Oct. 10. Use narrow row spacings. When seeding after the recommended date, narrow row spacings of 5-8 inches are preferred over wider spacings of 10-15 inches. If you use a wider spacing, such as with a 15-inch seeder, consider seeding twice, with the second pass at a slight angle to the first. Use one-half the seeding rate each time. This will only work with disc drills; hoe drills move soil and would bury much of the seed from the first pass. Increase the seeding rate. Late seeding usually results in less root and tiller development. A general recommendation for rainfed wheat is to increase the seeding rate 10 to 15 lb (150,000-225,000 seeds) per acre for every week after the suggested seeding date for your area in rainfed wheat. (The maximum seeding rate for rainfed wheat is 120 lb (1,800,000 seeds per acre.) Another option would be to limit the seeding rate to no more than twice the seeding rate for the recommended date for your area. Apply phosphorus with the seed. When seeding wheat late, phosphorus placed with the seed helps improve yield (see Figure 1). Use 20 lb phosphorus where none is called for by soil tests and increase other phosphorus rates which are over 20 lb by 20% for late seeded winter wheat. the generally high rates of seed used.